Recent reports have suggested that Audi are preparing to celebrate 2m car sales by 2020, and if they continue to go on as they have started 2015 then these predicted figures will be blown out of the water. Audi are hoping to ensnare customers of various markets, including the electric market with their ambitous and successful A3 E-Tron. It's worth considering the TT market has blossomed for Audi and the various modifications and improvements these set of vehicles have undergone has really outlined Audi's commitment to the vehicle, and indeed it's loyal support base. The first TT dropped in 1998, and since then it has become somewhat of an icon for Audi who have constantly topped-up the TT and all it's features. The newest version is not only signifcantly more efficient (110g/km), lighter and packs a far more thunderous engine - capping out at 155mph. The 2-litre TDi diesel racks up 67.3mpg and has the ability to reach 62mph in 7.1 seconds. You'll have two choices of engines including the TDI Ultra - a 182bhp 2.0-litre (the far more efficient, and economical choice of the two) and the 227bhp 2.0-litre TFSi along with a choice of gearboxes. Further to that, Audi insist on complicating your decision even more by offering two unique design structures to choose from, including the Sport and S line. The exterior is possibly one of the most iconic vehicles on the road, and the affordability of it's original models allowed it to become one of the most sought-after high-performance vehicles of it's generation. While it could be argued support has withered, it continues to be one of Audi's best-selling vehicles and that's even considering the excellent range they currently behest upon us. It would not be a TT without the adventurours, sloping tailgate, curved windscreen haunches and circular wheelarches. The TT carries the flag for models of old, but also benefits from a fresh injection of style and panache. One that it is hoped will serve the vehicle well in it's quest to achieve international acclaim, much as it's early models did. The TT's stand-out features is the spacious and high-res LCD Display which acts as a dashboard of sorts, or as Audi insists on calling it a ''virtual cockpit''. Gone is the traditional dashboard layout, underwhelming motorists for years and instead this shiny new addition sits proudly, just waiting to be spurred into action. The vehicle is so smooth to drive, and the handling is fluid and responsive. The TT is a high-performance sports/coupe by definition and this is certainly one of the most sports-geared vehicles of all of those gone-by, benefiting from Audi's Drive Select System and the potential for sports set-up. The steering balances well with the agility that the TT has always prided itself on. Overall the vehicle is in prime position for an ascension to motoring's pinnacle, although it'll have some job to do with the market far more competitive than it was when Audi first waded in. However, the prestige associated with Audi carries far more weight than one may think, and will undoubtedly contribute to the vehicle's perhaps inevitable success. With a host of safety kit, and exclusive features can you afford to miss out on this vehicle? Leasing is the most cost-effective medium of securing a brand-new vehicle, and in the current climate is one of the most economical choices you may ever make. 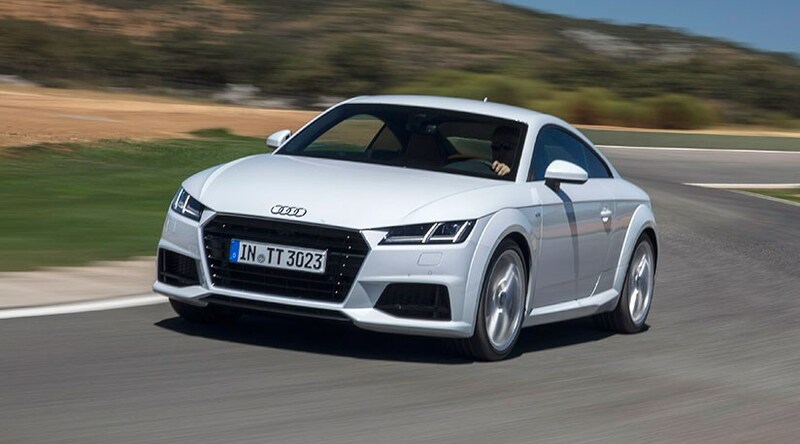 Our team of helpful, informative and experienced sales advisers are on hand for any queries may have, not just about Audi's brand-new TT but with any Audi vehicle in their illustrious and sought-after range visit Audi Business Lease, email:info@selectcontracts.co.uk or call: 0845 6770 770.